What is the procedure to check your PF balance? To view the PF passbook on the portal you need to have your account tagged with your Universal Account Number (UAN). You can download or print the passbook from the website. Step 1: Go to the EPFO portal. Click on the tab ‘Our Services’ and choose “for employees” option from the dropdown list. Step 3: The following Login page will appear. Here you need to enter your UAN number and password after it has been activated. After logging in, you can access your EPF account. If your UAN is registered with EPFO, you can get details of your latest contribution and the PF balance by sending an SMS to 7738299899. You need to send this message: EPFOHO UAN ENG. ENG is the first three characters of the preferred language. So, if you want to receive the message in Marathi, then type in EPFOHO UAN MAR. The facility is available in English, Hindi, Punjabi, Gujarati, Marathi, Kannada, Telugu, Tamil, Malayalam, and Bengali. EPFO can only send details of members available with it. So, make sure your UAN is seeded with your bank account, Aadhaar and PAN, else ask your employer to seed them for you. If you are already registered on the UAN portal, by giving a missed call on 011-22901406 from your registered mobile number will fetch you the details. Here, too, make sure your UAN is seeded with your bank account number, Aadhaar and PAN, else ask your employer to seed them for you. In response to the missed call, the EPFO would send you an SMS. This SMS contains the information about the EPF balance in your account. Along with this, the SMS has Following details. To get the EPF balance through the SMS, you must fulfill these condition. The UAN should be activated. Your correct mobile number should be given at UAN portal. The UMANG App – https://web.umang.gov.in/web/#/ can be downloaded from Google Play Store. Once the app is downloaded, login using UAN No. and click on ‘Member’ and then on ‘Balance/passbook’. 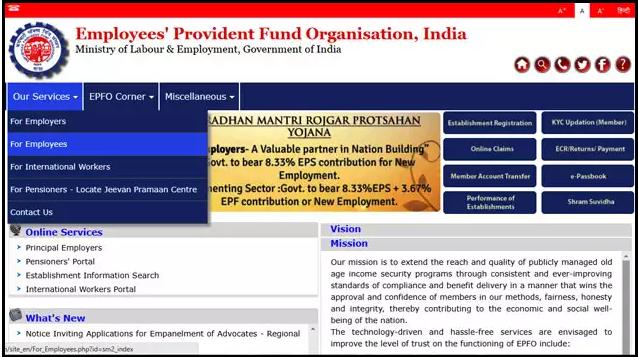 UAN & Services under EPF - UAN also known as Universal Account Number is a multiple PF member IDs allocated by EPFO. Listed in this are the services under EPF. ← Do we need a CA to file a monthly GST return?